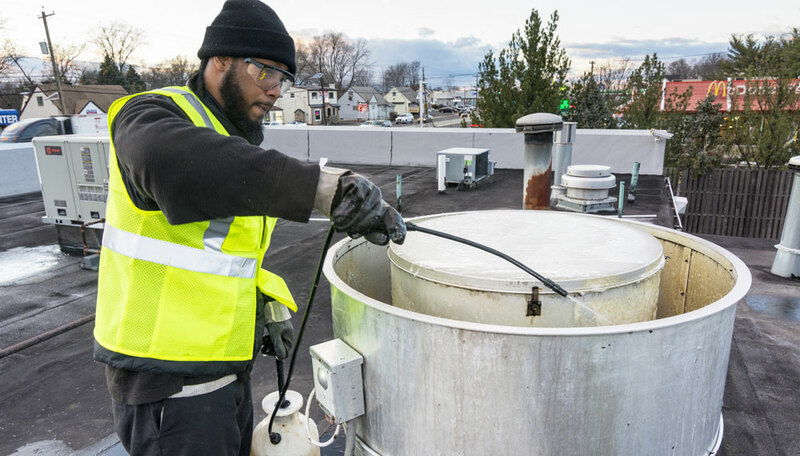 FLEETWASH trained technicians will hot-power wash, steam, and hand clean the entire kitchen exhaust system from the rooftop fan all the way down to the cooktop. 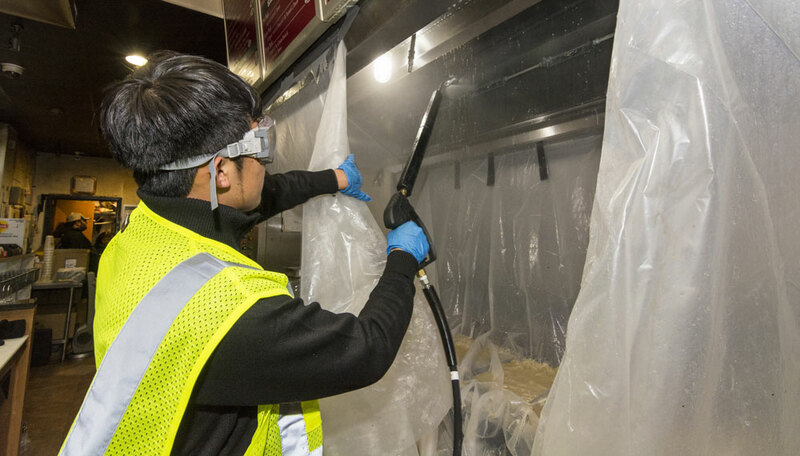 FLEETWASH leaves your kitchen exhaust system and work area spotless. Our professional staff begins by checking in with you at the start of service. Each FLEETWASH team has been trained to maintain the highest of standards. Each service includes a vacuum, power wash, scrub, and polish your hood until it shines. Nobody does it better! Why is a clean hood important? 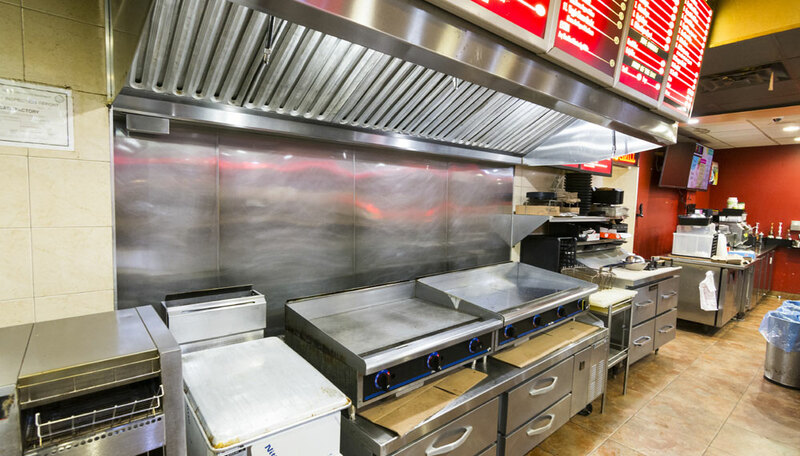 Maintaining a scheduled hood cleaning program keeps your restaurant kitchen cleaner and lowers your risk of grease fires and smoke problems. 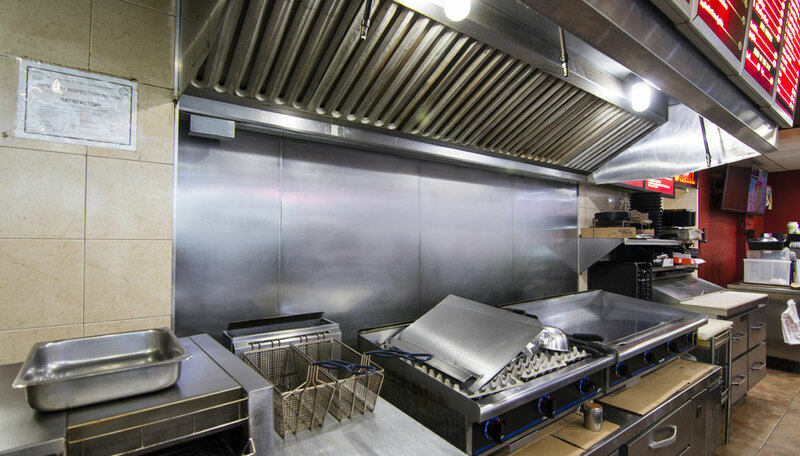 Many kitchen fires begin on cooking appliances and flare up into the kitchen exhaust system. 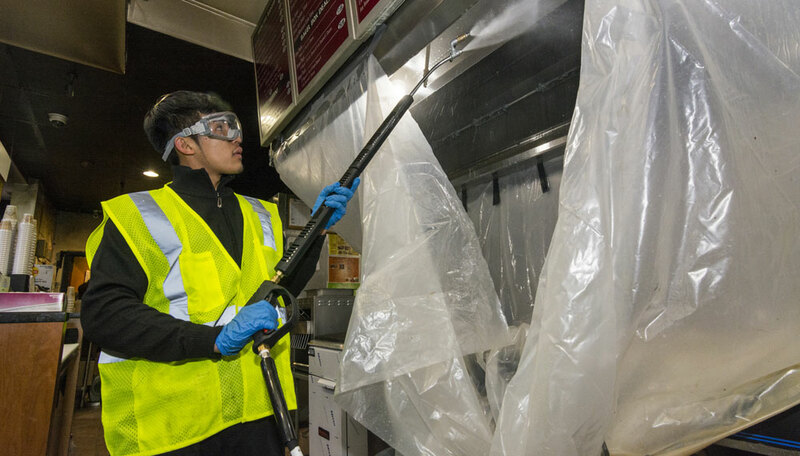 Regular cleaning of the exhaust system and kitchen equipment are one of the primary defenses against fire hazards. It's also essential for your facility to present the best image during government audits. 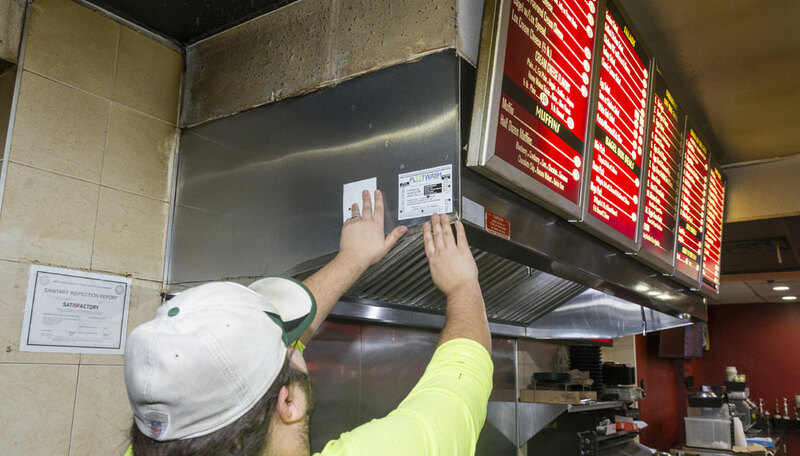 FLEETWASH is licensed by the NFPA to certify your kitchen exhaust system as clean and safe - we post our FLEETWASH certified sticker on your hood at the completion of the job. 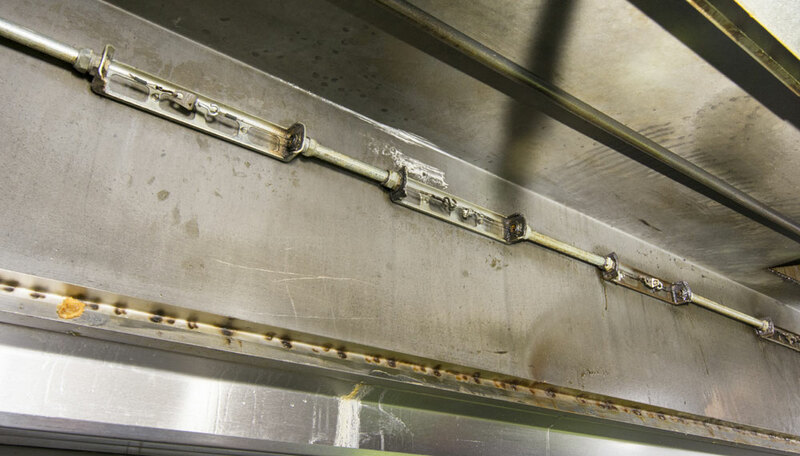 Dirty hoods and exhaust systems can put your facility at risk of grease fires and smoke problems. 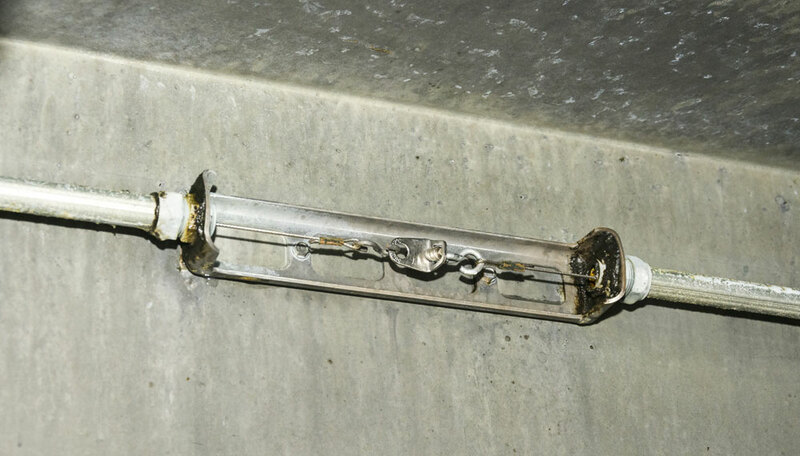 Grease build-up can prevent fire protection mechanisms from working properly and add to grease fire risks. 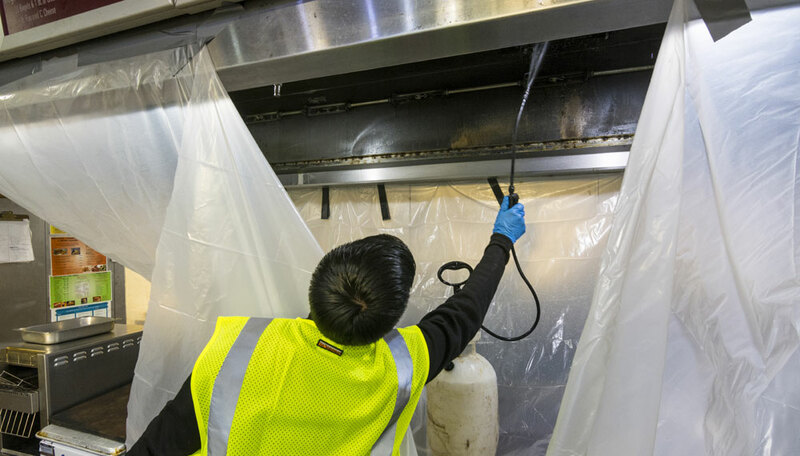 FLEETWASH professionals will provide a complete hood system analysis and explain what your system needs for a complete kitchen exhaust system cleaning. 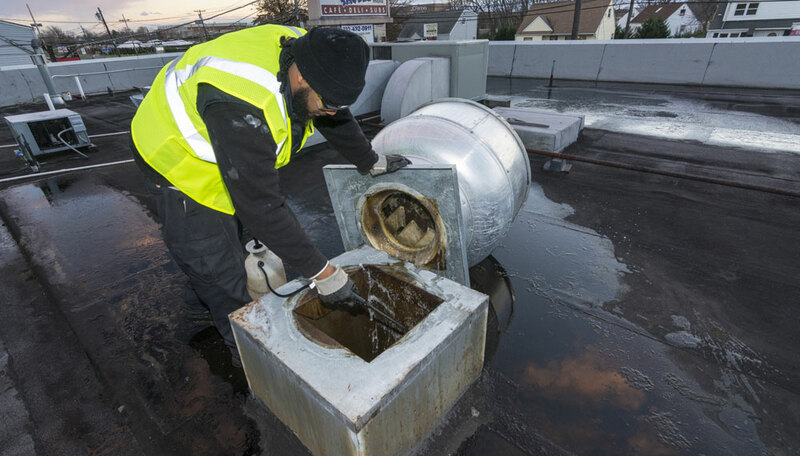 FLEETWASH crews will prep the area and remove hood vents to be pressure washed and scrubbed outside. 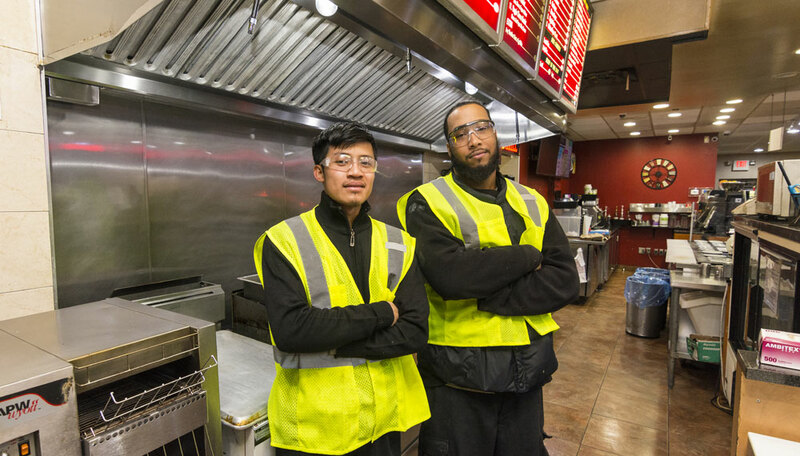 FLEETWASH crews protect the cooking surface and surrounding area during the hood cleaning process. 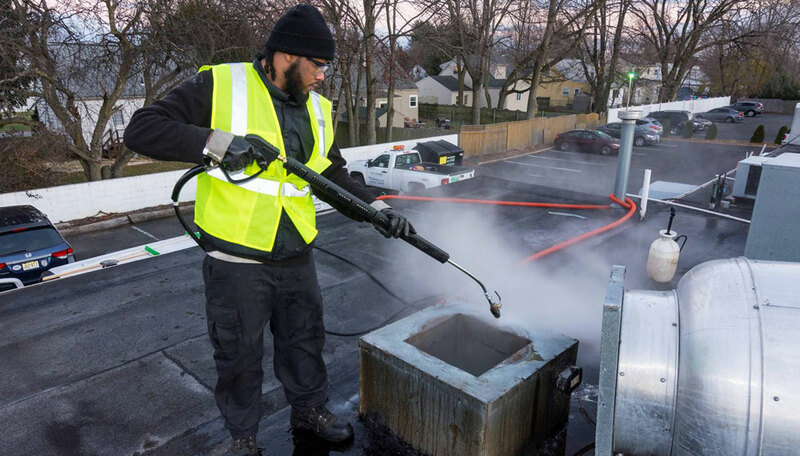 FLEETWASH sprays the area with a biodegradable degreaser and hand-scrubs grease and build up around the hood area. 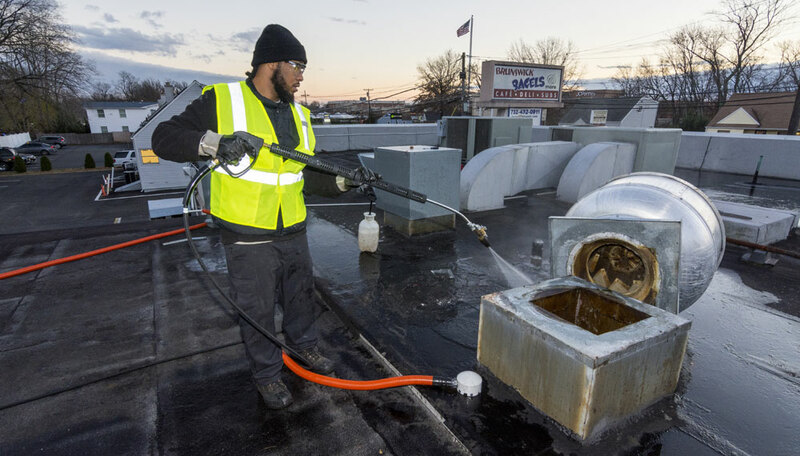 FLEETWASH sprays the roof exhaust system with biodegradable degreaser from the outside. And FLEETWASH treats the inside of the exhaust system with the biodegradable degreaser. FLEETWASH hauls their patent-protected water treatment system to the roof and hot-power washes the exhaust fan and surrounding area. With FLEETWASH all wastewater is isolated, collected and removed from the facility in our water containment vehicles. FLEETWASH crew will then hot-power wash the hood itself, rinsing all biodegradable degreaser away and leaving a grime-free surface. FLEETWASH crew will vacuum, clean and polish the hood and support structure before replacing hood vents. 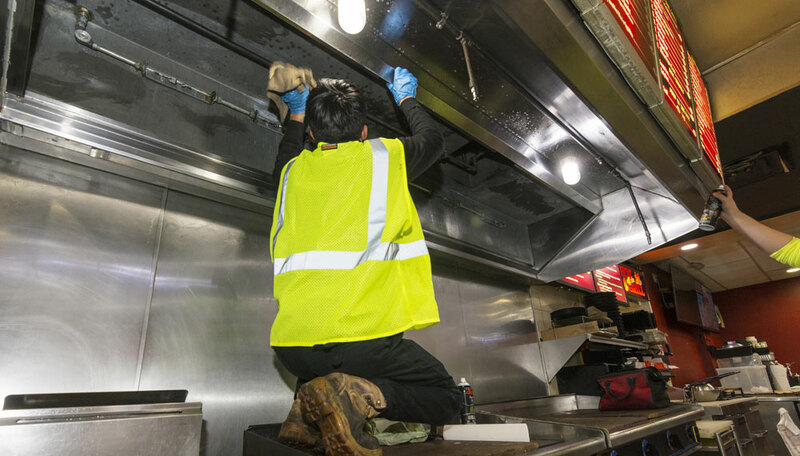 FLEETWASH inspects all elements of your kitchen exhaust system and reports and needed repairs or issues to the facility manager prior to the conclusion of the job. FLEETWASH crew leader will place the official FLEETWASH cleaning certification sticker on your hood at project completion. 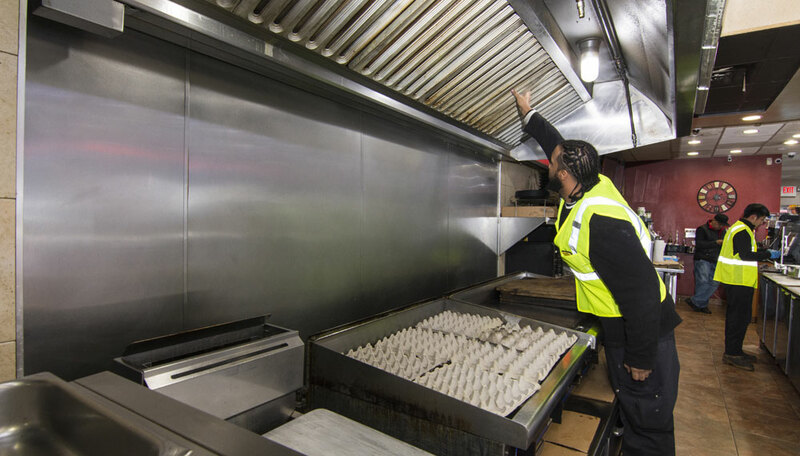 FLEETWASH thoroughly cleans the work area before the job is done – leaving behind a gorgeous, shiny, grease-free cooking area and exhaust system. With FLEETWASH satisfaction is guaranteed. 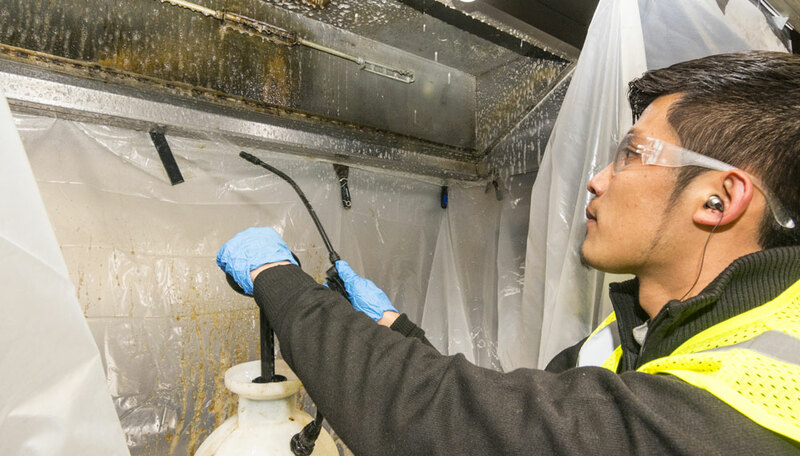 At FLEETWASH, we provide a complete hood system analysis and explain in detail of what your system needs for a complete kitchen exhaust system cleaning. We have the experienced staff to do the cleaning the right way, the first time, and to ensure compliance with all applicable fire and health codes. 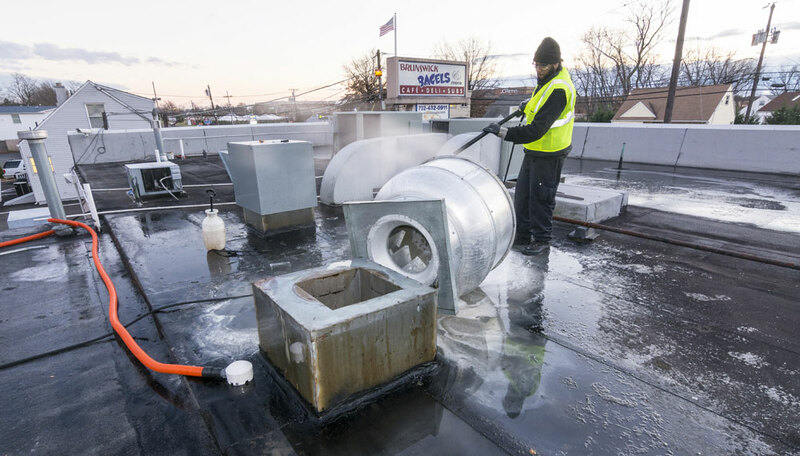 FLEETWASH technicians steam and hand clean the entire kitchen exhaust system from the rooftop fan down to the cooking equipment. 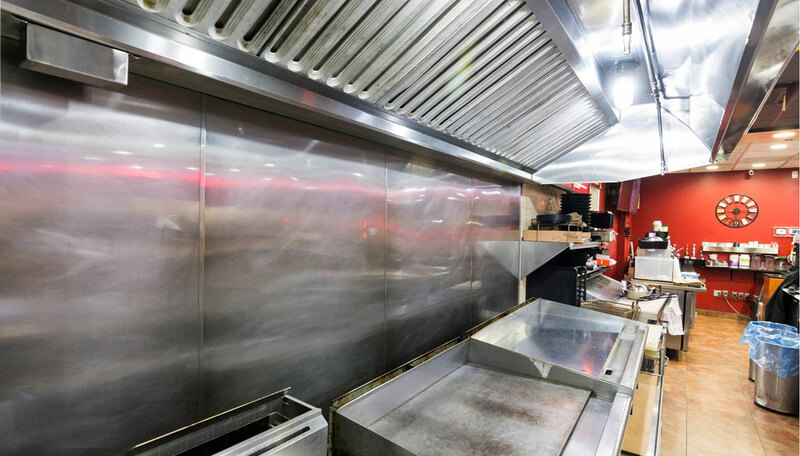 FLEETWASH service includes covering and protecting all kitchen equipment in the area, complete water cleanup, drying and polishing of all stainless-steel surfaces which we cleaned. FLEETWASH is the largest on-site mobile power washing company in the country with services available from Coast to Coast. FLEETWASH has 24/7 "On Call" Servicing. FLEETWASH takes the environmental impact of what we do very seriously; we strictly follow the regulation guidelines in your State and Local area that are designed to protect our environment from water runoff. FLEETWASH's patent-protected water containment methods isolate, capture, transport the wastewater for proper and legal disposal. 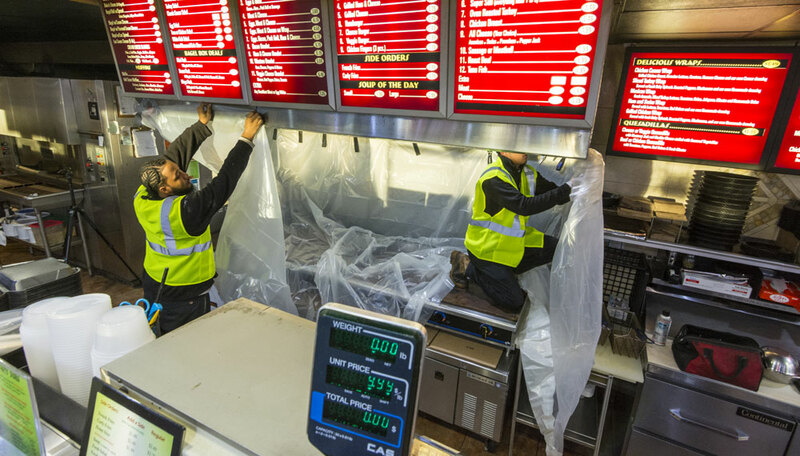 FLEETWASH strictly follows the National Fire Protection Association (NFPA) Standard-96 that was designed to protect commercial cooking operations. 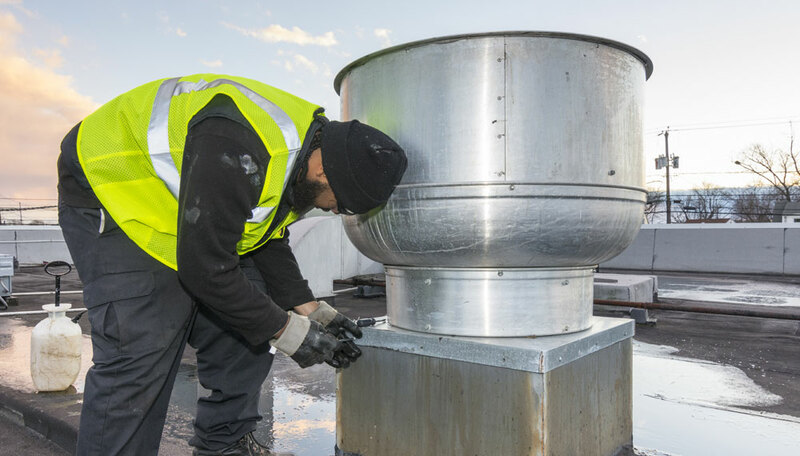 A system that is safely working at the maximum performance will lead to a working environment that's cooler, cleaner and more productive for the staff. FLEETWASH assumes all risks and liabilities for proper water recovery and compliance with your Local, State and Federal regulations.